All those chicken feet look gross. LOVE LOVE LOVE using the crock pot to make stocks! Such a time saver! I grew up on a farm. How do they clean those feet so they are pristine enough to eat?????? No idea, but they are clean. Have you ever been inside a chicken coop? Not sure I'd want to be eating feet. They don't call them "foul" for nothing. In fact, we OWN a chicken coop, and yes, we go inside it daily. Our chickens feet are very clean, even without being washed. So I'm not worried about it. Those are Rosie's of Petaluma chicken feet. Rosie's are fed soybean meal (probably GMO) and are not really free range (if they were, their diet wouldn't be entirely vegetarian, as they would eat bugs). Water is added to make them plumper. These are organic, so not GMO. Are they the perfect chickens? Hardly. But I doubt the ready-made organic stock at the store is made from better chickens (or chicken parts). Get over it. I was wondering the same thing -- how to they clean them? Not a comment post, just a personal note. I had emailed about flouride and Kumbucha a while back. Sarah, the Health Home Econimist (I know, I agree, her 'birth control' article was horrid!) has a post on the flouride in the Kumbucha. http://www.thehealthyhomeeconomist.com/fluoride-in-kombucha-should-you-be-concerned/#more-11719 ... Good info. We had potluck at our church yesterday. I find in a lot of the IFB circles I have been in that we are looked at as some strange new agers if they know we eat 'traditional/organic/chem free'. So, I would love to go to a potluck at your church (as well as be welcomed to sit with all my children during a service.) Hope you are enjoying your summer so far. From Canada, Crystal. Thank you for the link - very interesting! And yeah, churches serving the cheapest, crummiest food makes me roll my eyes. Love your blog, but that is nasty! True - few of us are used to seeing where food comes from. Your husband makes six figures. Just boil a footless, headless, free range chicken! BTW, have you ever heard the saying "You learn how to be frugal from rich people" - there is a lot of truth in it. Just because you can afford to buy something for more money, doesn't mean you should. 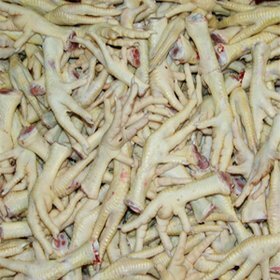 Have you ever looked up a recipe for deep fried chicken feet? Guess it's quite popular *somewhere* ;) We just butchered chicken Friday. This year and last year my sisters brother-in-law wanted the chicken feet to deep fry them. I had NO IDEA you could make stock with it... That means I THREW AWAY 150 feet this year, and 400 feet last year :( Wow, what a waste! In Spain, we have a saying: "Del cerdo [se aprovechan] hasta los andares" (Of the pig, even the walks [are put to use]). And now with the Internet, it is very easy to find out how! So if you find yourself throwing something out regularly, do just that. For instance, carrot tops, and radish tops, both can be eaten.